Ophira Gamliel studied Indology and Egyptology at the Hebrew University of Jerusalem in Israel. For her post-doctoral studies, she spent a year in the Department of Malayalam and Kerala Studies at the University of Calicut in Kerala, India. She has worked as an adjunct lecturer, teaching fellow and language instructor at the Hebrew University of Jerusalem and Bar-Ilan University (Ramat-Gan, Israel). Ophira also received numerous research grants and fellowship invitations, of which the most recent was for research on the use of Malayalam language in the Sanskrit theatre of Kerala (under the auspices of David Shulman and Heike Moser). 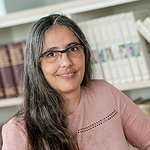 Ophira’s broad research interests vary from linguistics and philology – specializing on Sanskrit and Malayalam language and literature – to performance arts and folklore. She is the author of three books Yogis, Kings and Celestial Women: Translations of Selected Sanskrit Myths (Jerusalem 2001), Shiva in the Forest of Pines: Translations of selected Sanskrit Myths (Jerusalem 1999) and Introduction to Malayalam Grammar (Jerusalem, forthcoming). As a KHK Visiting Research Fellow, she intends to work on a project entitled “Sensory Devotion and Inter-religious Encounters: Shared Festivals in Kerala (South India)”.